Springbok scrum-half Ricky Januarie has announced his retirement from international rugby with immediate effect and withdrawn from the preliminary Rugby World Cup squad. The Stormers No.9, who will sit out the rest of the Super Rugby season with a hand injury, is set to link up with French Top 14 side Lyon next season and has decided to focus his efforts on that challenge. "I've had a great run in South African rugby and have some fantastic memories but the time has come to move on," said the 29-year-old Januarie. "Lyon have offered me a new beginning and I want to concentrate all my efforts on helping them in their first season in the French Top 14." Januarie's decision followed talks with Springboks coach Peter de Villiers who was quick to pay tribute to the 47-cap half back. "Ricky has been a great servant to the Springboks and to all the teams he has represented over a long and successful career," said De Villiers. 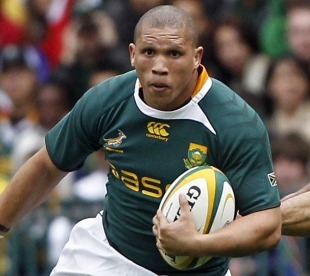 "He is a combative and fearless player and has been a part of some memorable Springbok performances. I wish him all the best for the new chapter in his playing career. Ricky and I chatted and he knew where he stood in our Rugby World Cup plans. He has reached the stage in his career where he wants to move on and there was no reason to stand in his way. He has produced some memorable moments over the years and his match-winning try against New Zealand in Dunedin will be remembered as long as the Springboks play." Januarie made his Test bow against Uruguay in 2005 under former coach Jake White and his last appearance came against New Zealand in Soweto last year. He collected winners' medals at the World Under-21 championships in 2002 and Rugby World Cup in 2007 and was part of the Springbok squad that won the Tri-Nations and the series against the British & Irish Lions in 2009.